This project was a challenge in more ways than one. 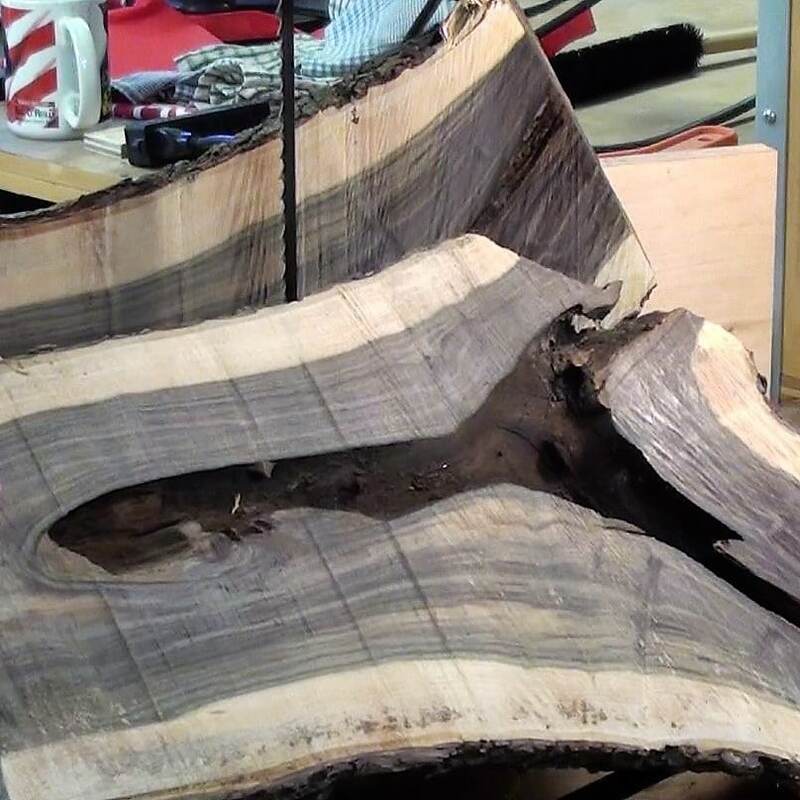 First of all, Texas Ebony is very hard and will be a challenge to turn in any case. 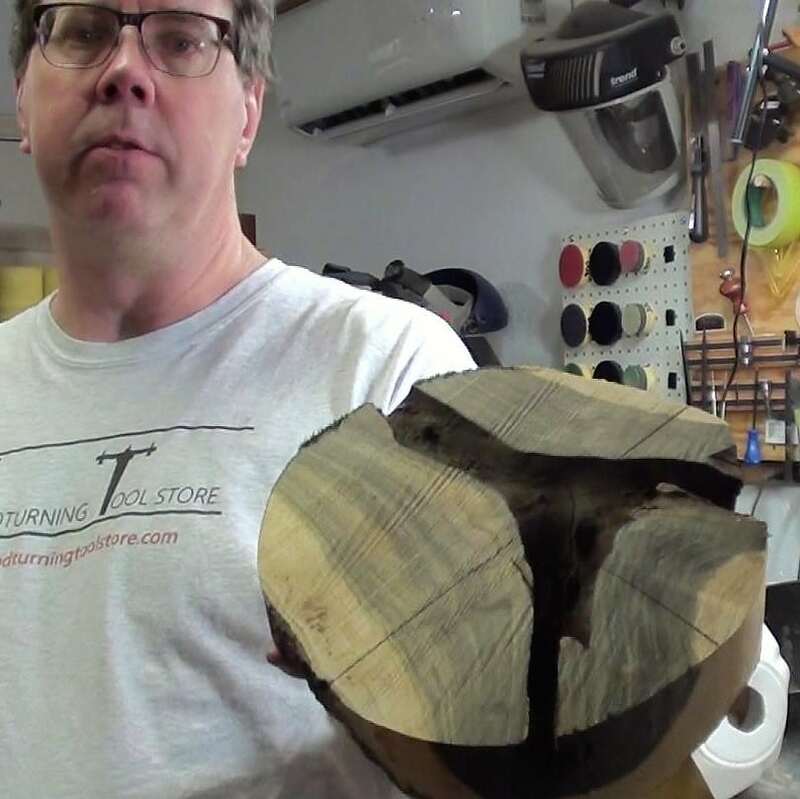 But this piece came as a crotch log section that I have to figure out how to mill. On top of that there is insect damage and rot in the heart of the pith areas on both branches of the crotch. 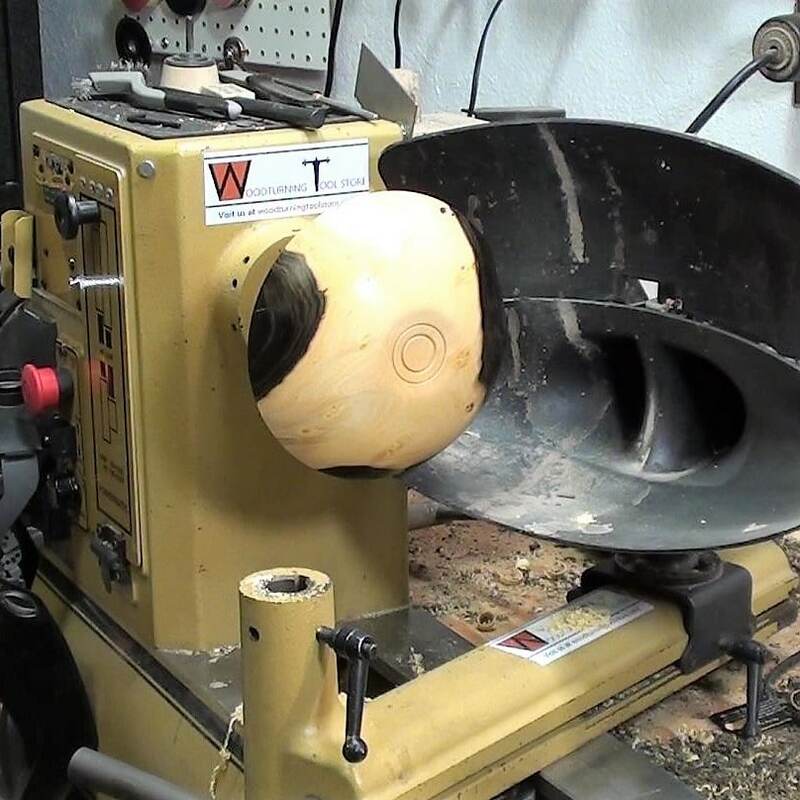 Once I had the bowl blank milled then I had to figure out how to hold the piece on the lathe. 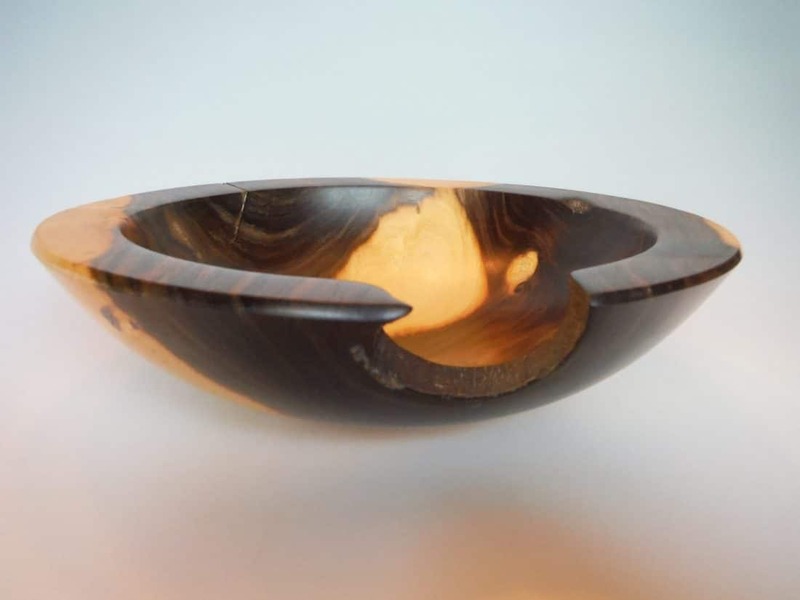 The inside of the bowl blank had cavernous voids like the Grand Canyon running through the heart of the crotch grain pattern. Last, but not least, was the horrid stench that I had to live with in my shop for a couple of days during this project. Keep the air freshener handy, folks. Despite all of the challenges this is a beautiful bowl and one of my favorites. Actually, my wife has claimed it and she likes it even more. So first thing was to lay out how to cut the log section. I started by marking straight lines across the face of the branch ends using a ruler and marker. These layout line were in-line with the length of the log. 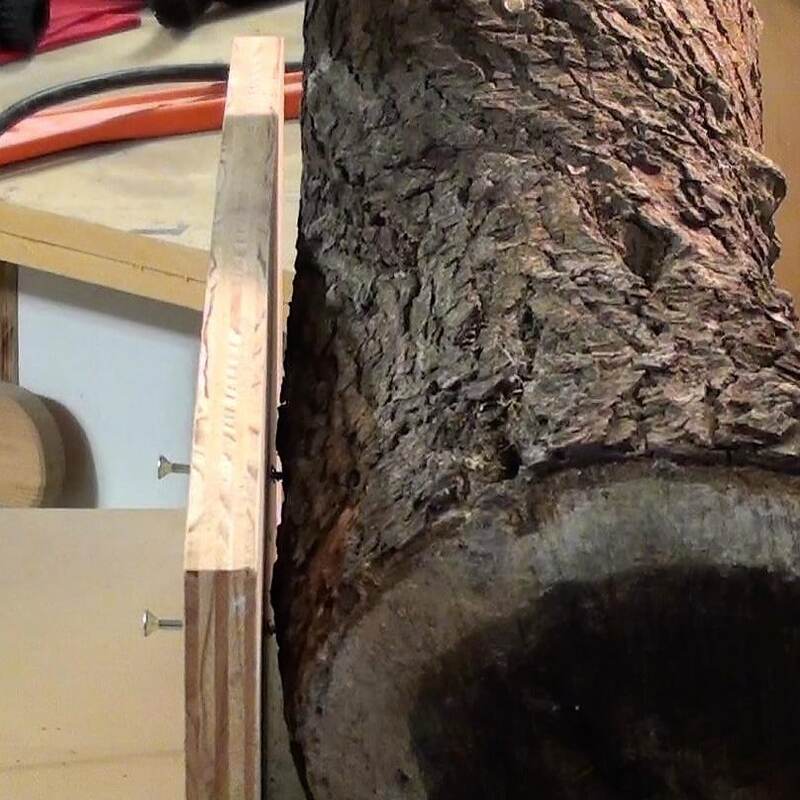 I also made a similar lay out line across the single end (the trunk end) of the log. I joined these lines down the outside of the log. 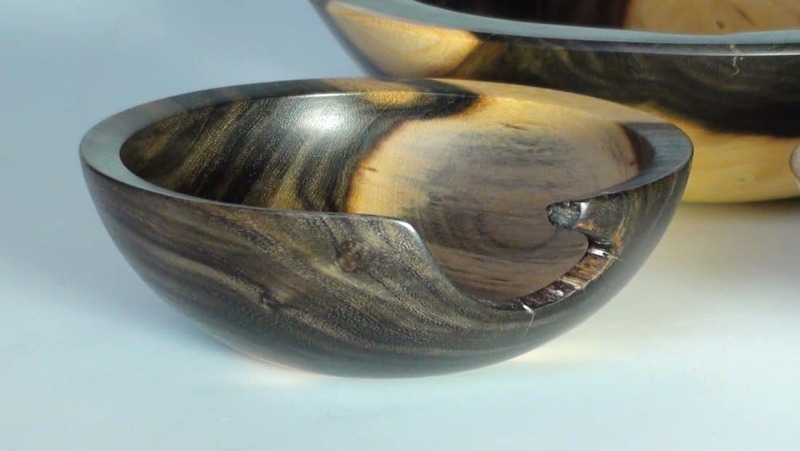 I wanted to ensure to get a matching bowl from each side of the crotch section which means I had to cut it down the middle. This could have been done with a chainsaw but I chose to use the bandsaw. I had this T-shaped jig for some time. It is simply two pieces of plywood glued and screwed together. 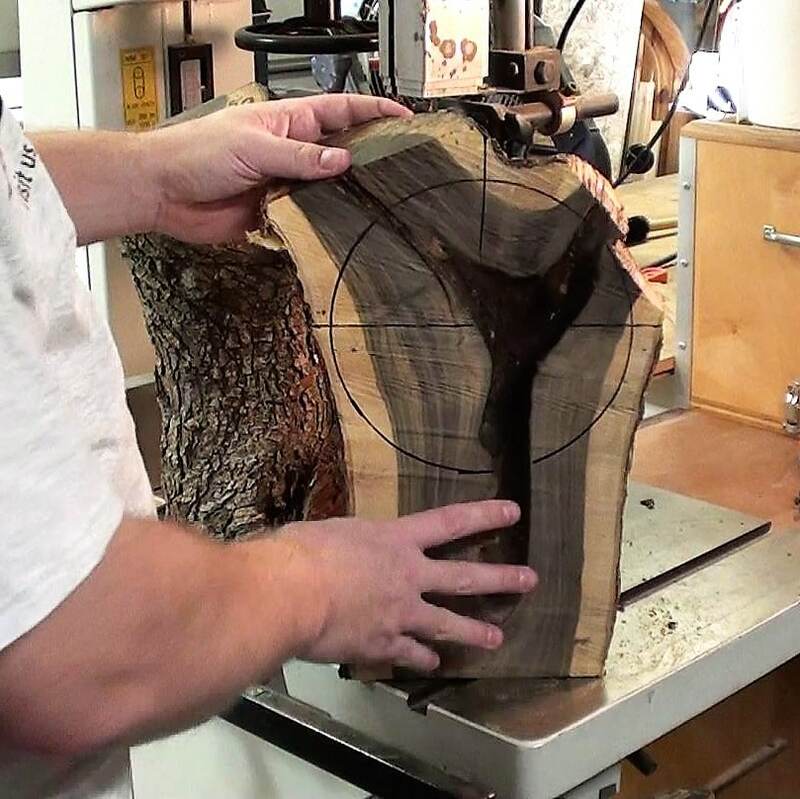 I set the log section against the bandsaw T-shaped jig and used the layout lines I created to align the log perpendicular to the table and to ensure that each end would be equal distance from the jig. I used my combination square to sight the line on the log. 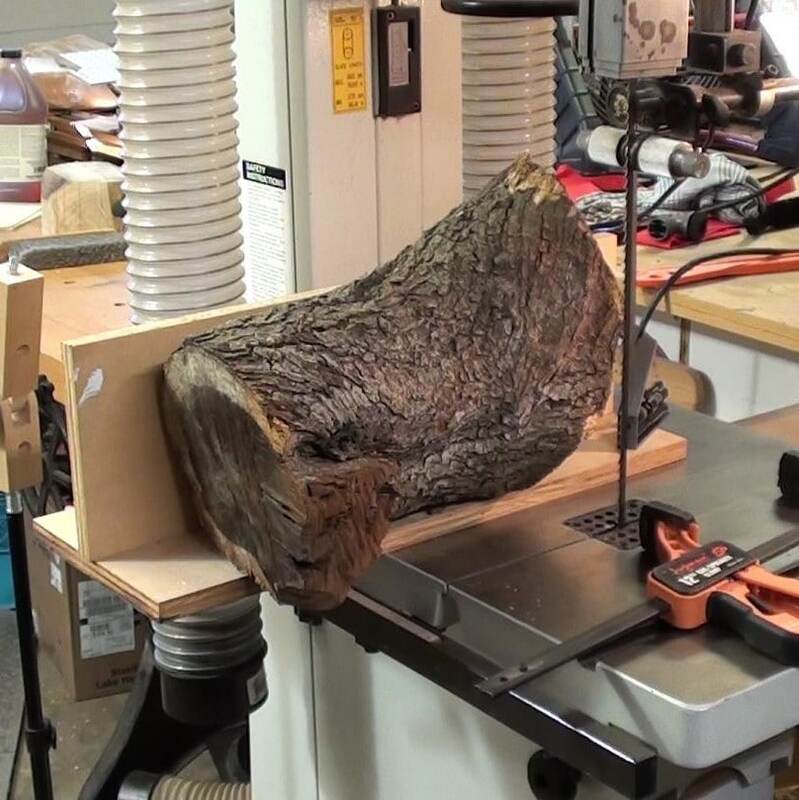 I wiggled the log around until it was where I wanted it and then used a clamp to hold it into position as I embedded two 3” wood screws through the jig spine and into the log section. 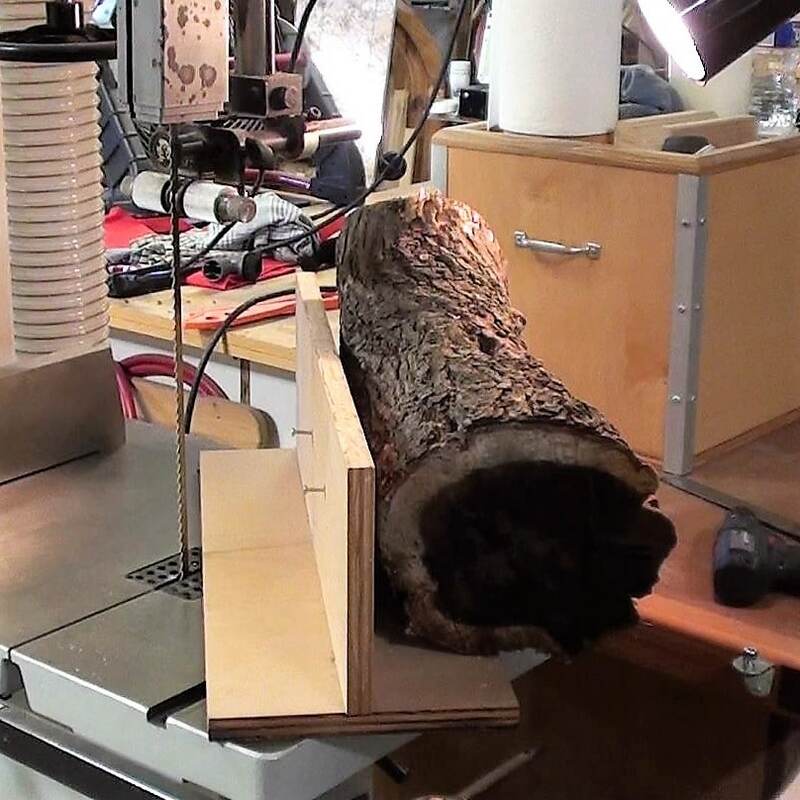 This way the log would be split along the layout line as the jig was held against the bandsaw fence as the piece was cut. 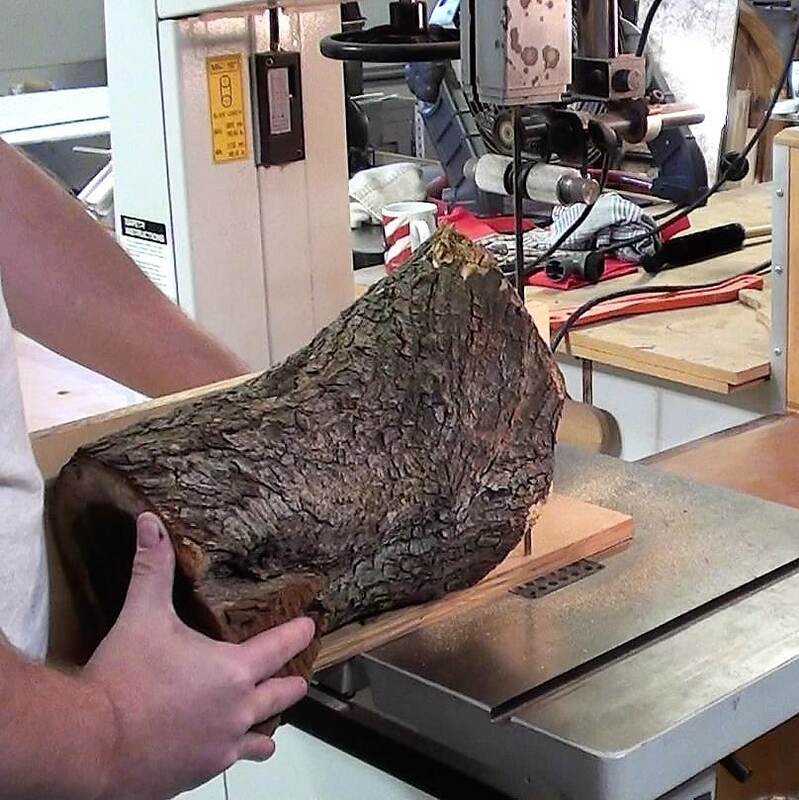 As I cut the log on the bandsaw the smell was horrible. I liken it to the fart of a wet swamp dog. No offense to dogs but the smell was noxious. Out came the air freshener. I sprayed directly on the cut pieces and that seemed to help. The inside of this log was hollowed out but the flesh left is solid and sound. 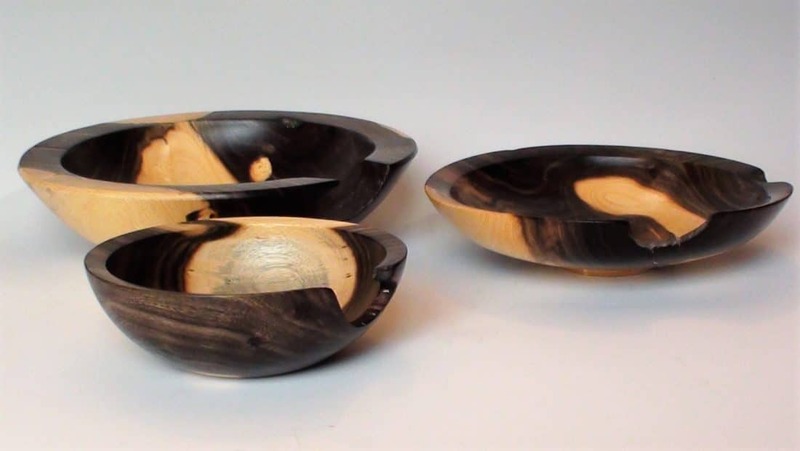 The grain is tight and the contrast between the heartwood and sapwood is striking. Next I used a clear plastic circle layout tool to figure out where on the half log sections I want the bowl. I ended up choosing the crotch section. I transferred the center mark from the front (or inside) of the bowl to the back side by using the three points of the circle template (i.e. 0, 90 and 270 degree marks). 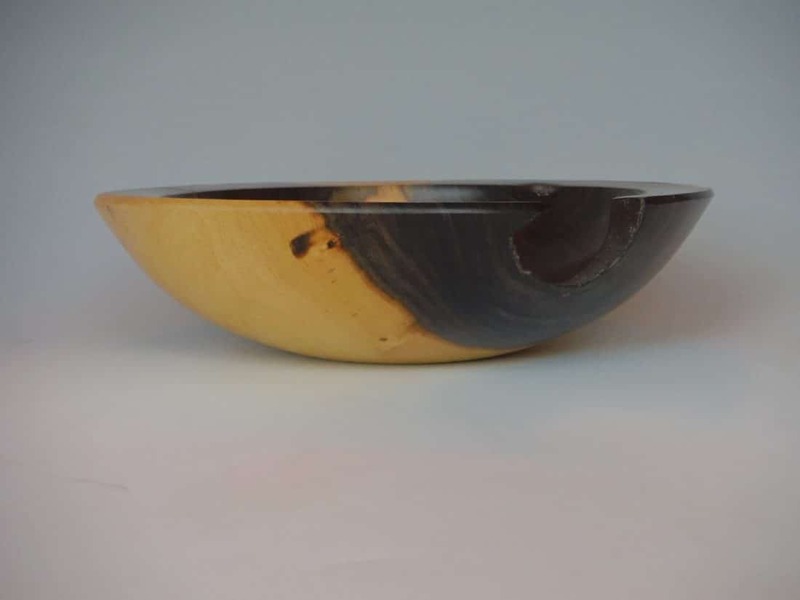 The center point on the top of the bowl blank ended up in the rotted out void. 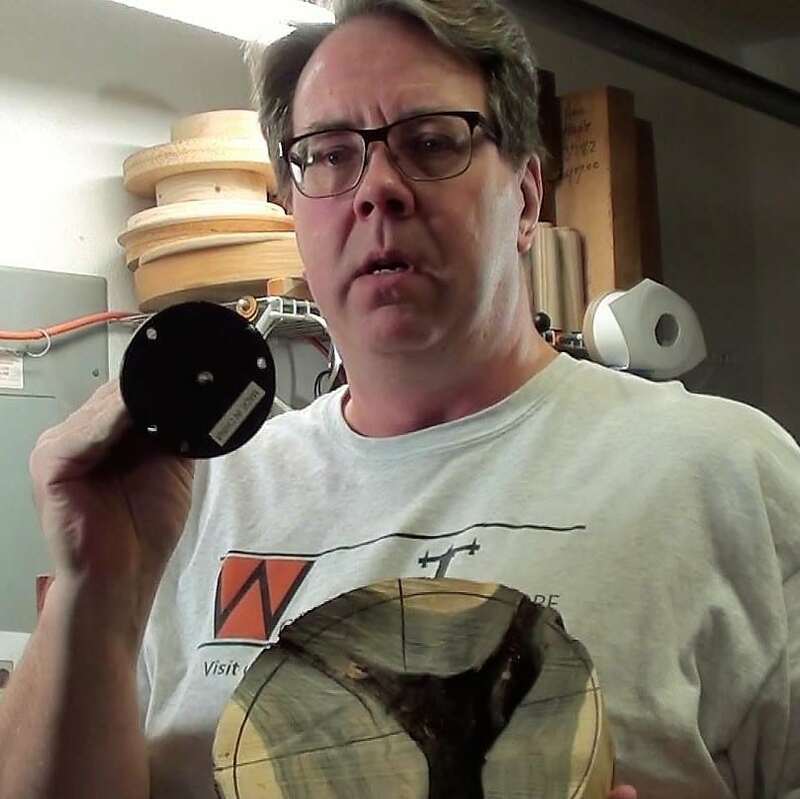 To be able to drive this piece on the lathe and maintain the orientation of the piece, I used the 3.5” Elio-DR Safe Drive. This #2 Morse taper drive center has a center point that can extend about 1.25” from the faceplate area. This extended center point reaches into the void to establish a center drive. 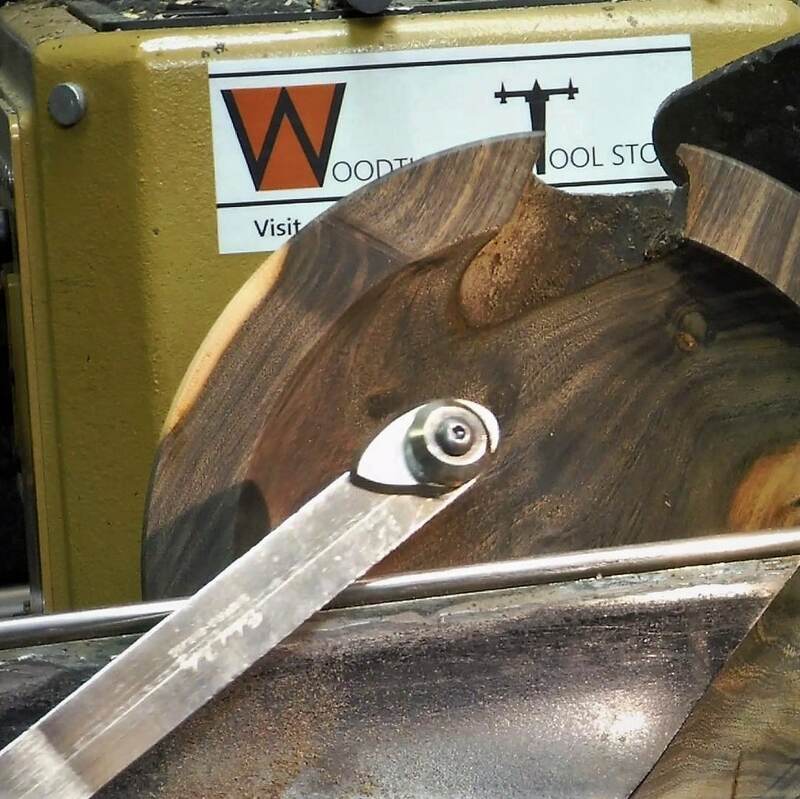 The two pointed screw drive pins can bore into the heartwood beyond the void area to provide the torque. Once the piece was mounted, I was able to adjust the screw pins and the tailstock location to move the piece a little bit to align the top face perpendicular to the rotation. This allowed me the get a better balanced piece and was easier to turn. 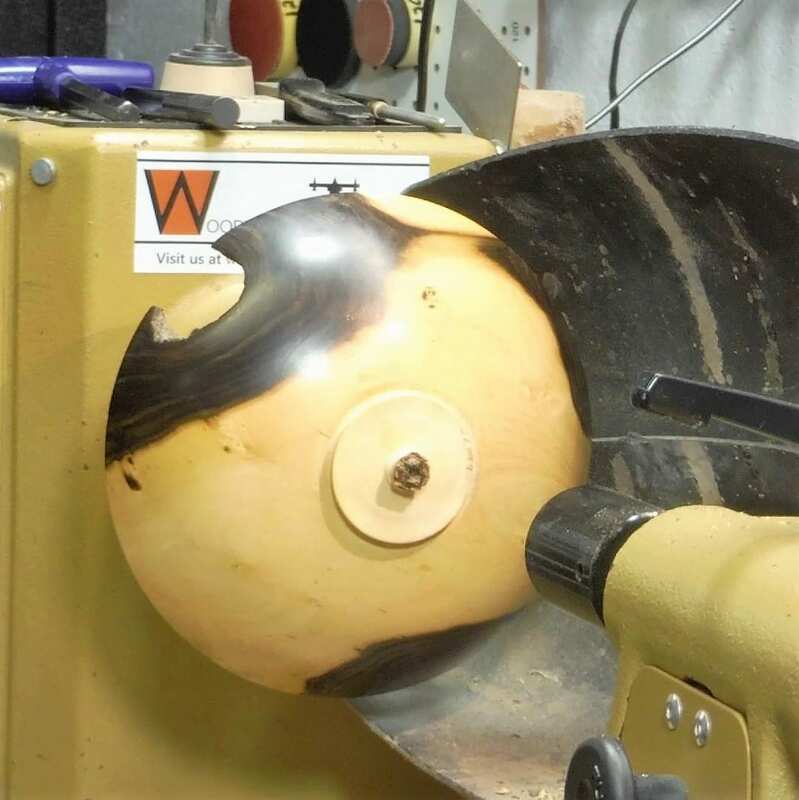 Once mounted I started turning the bottom by removing the corners to form a bowl shape. I used a Carter and Son ½” bowl gouge in a 12” signature aluminum handle. 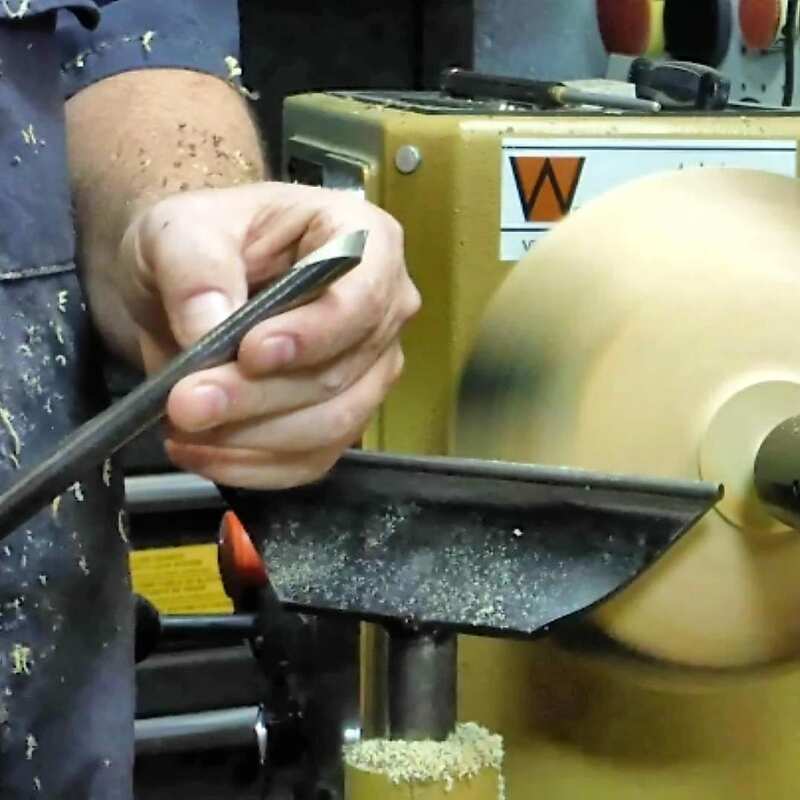 The gouge has a swept-back grind with a nose angle of about 50 degrees that helps bowl shaping using push cuts, pull cuts, shear scraping and other cutting actions. This tool was comfortable and strong. I could only turn at around 650 rpm since the blank was out of balance. 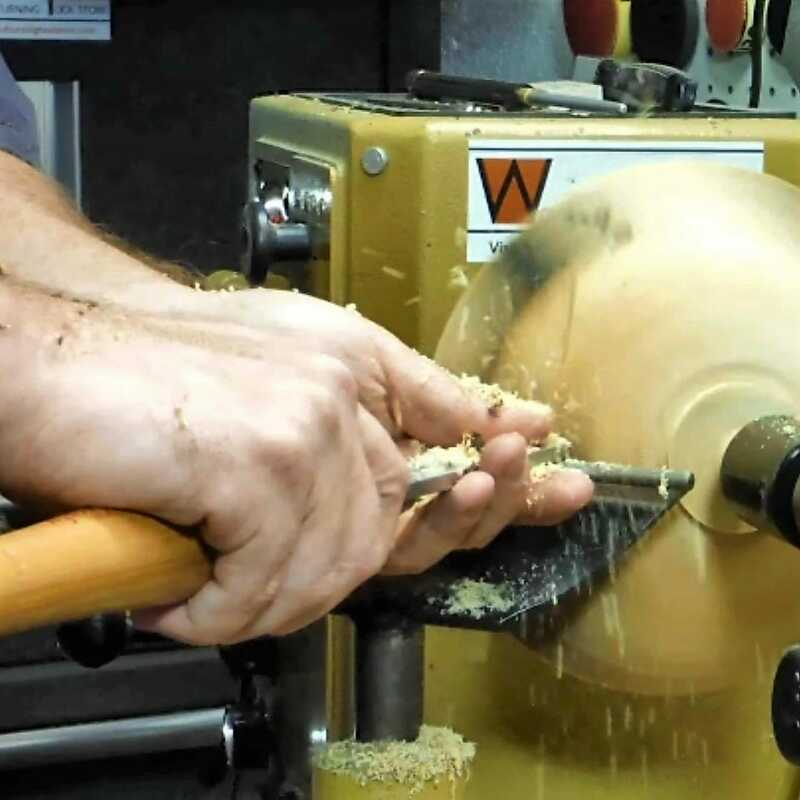 I tend to start bowls with a push cut so that the shavings get shot out of the flute away from me. 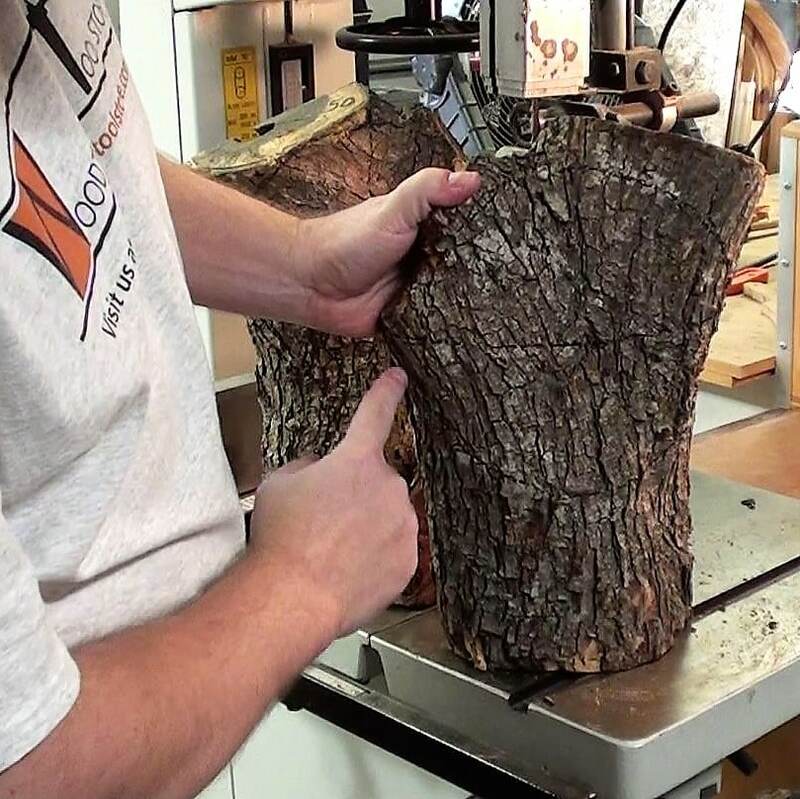 The first few cuts are typically bark and I find this is the safest way to start. Eventually I was able to use a push cut to clean up the surface. 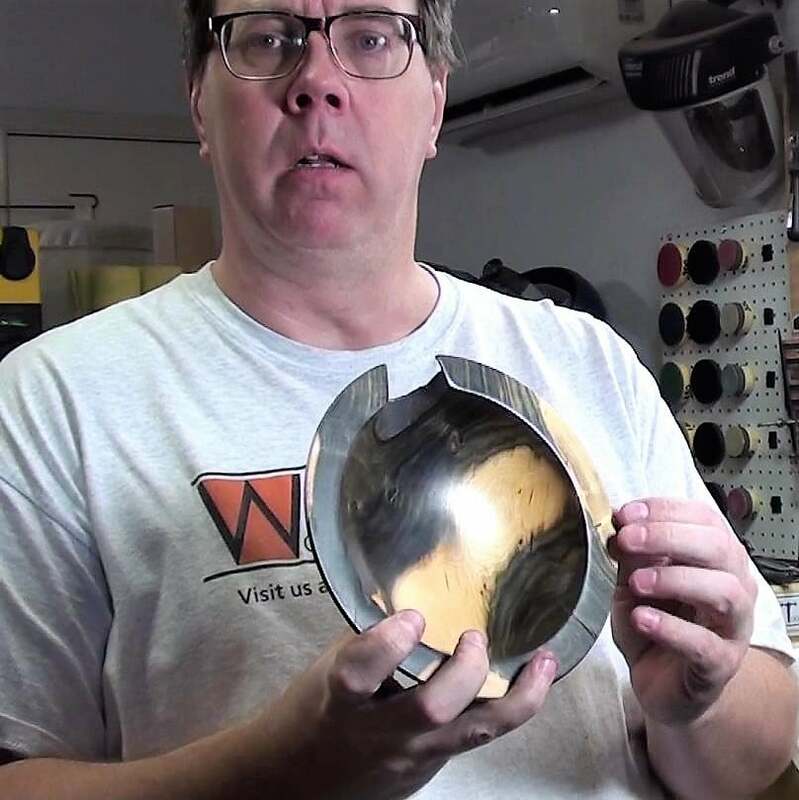 I was only able to get a bevel on the upper half of the bowl because the tailstock prevented me from getting any closer to the bottom. As I said this Texas ebony is hard therefore I had to stop and hone my gouge. 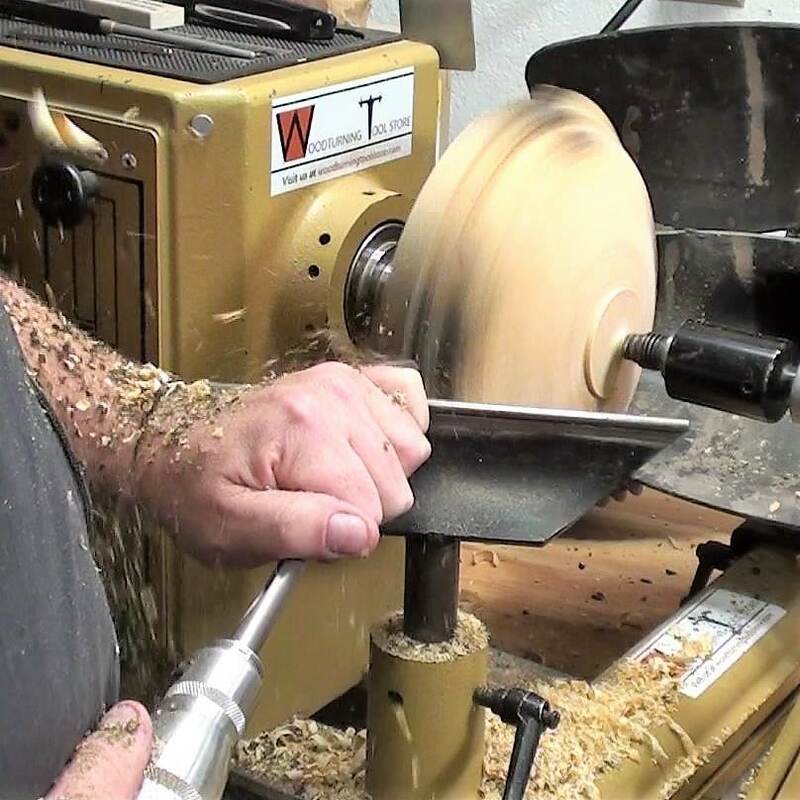 I typically hone my tools if I am in the ‘groove’ of turning. 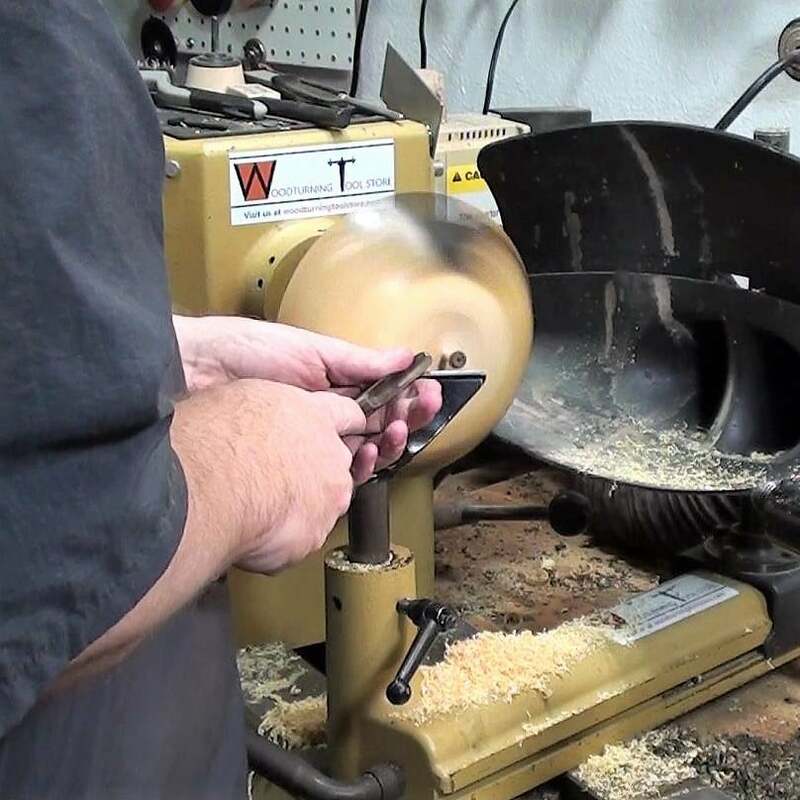 I didn’t want to stop go to the grinder as I would have interrupted my progress of removing wood from the bowl shape. I used the credit card hone on the outside of the gouge and then used the pen (or rattail) hone to get the inside of the flute. Now if I am going to make the final finishing cut then I would probably re-grind and perhaps hone a little as well. 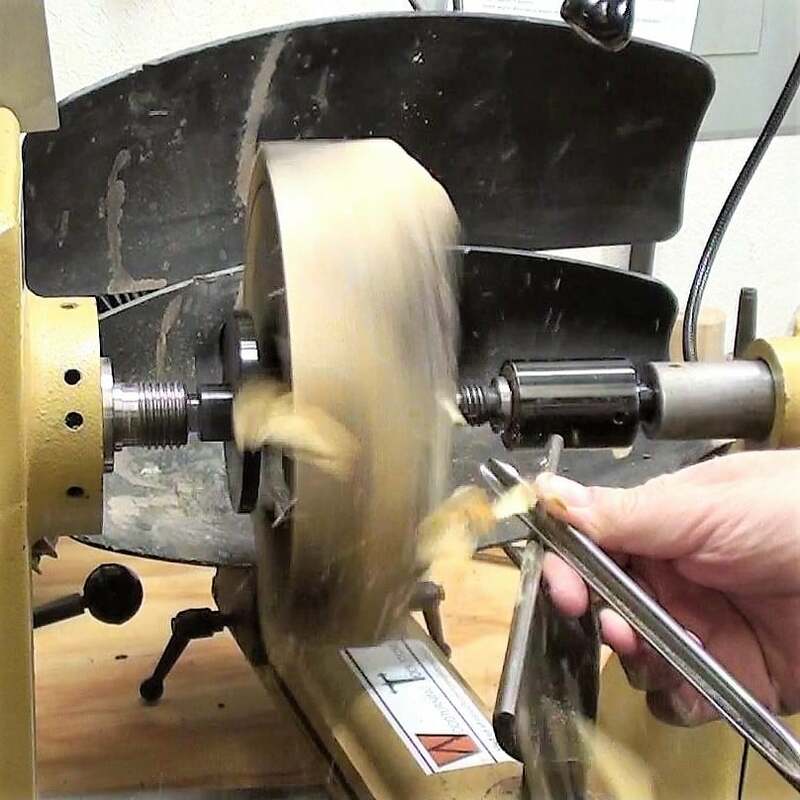 The Jimmy Clewes Woodturners Sharpening Kit is an excellent value as it has a great selection of hones that are useful and needed at the lathe. 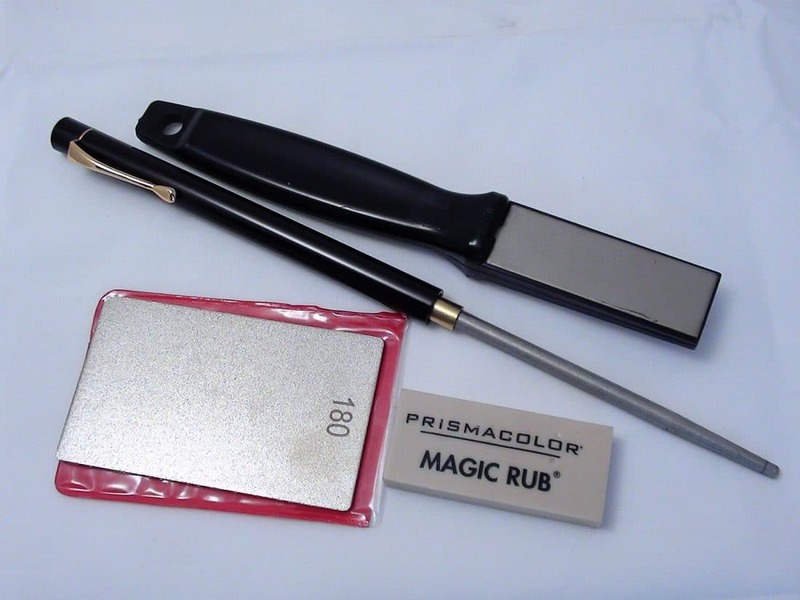 See my YouTube Video to get an overview of the kit. 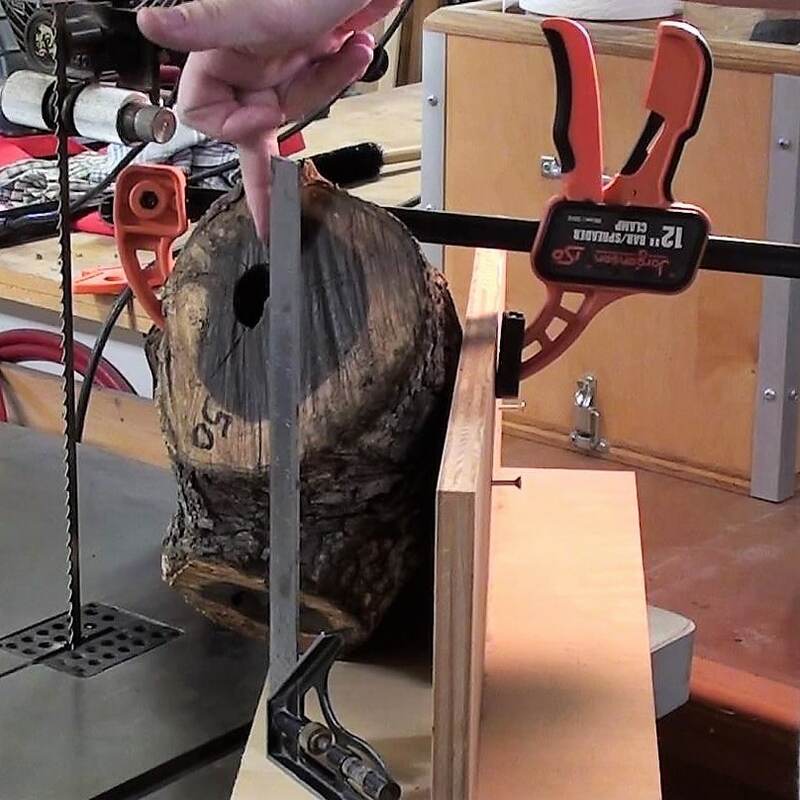 I used dividers, set to the diameter of my chuck jaws when closed plus about ¼”, to mark the tenon that I will form on the bottom of the bowl. 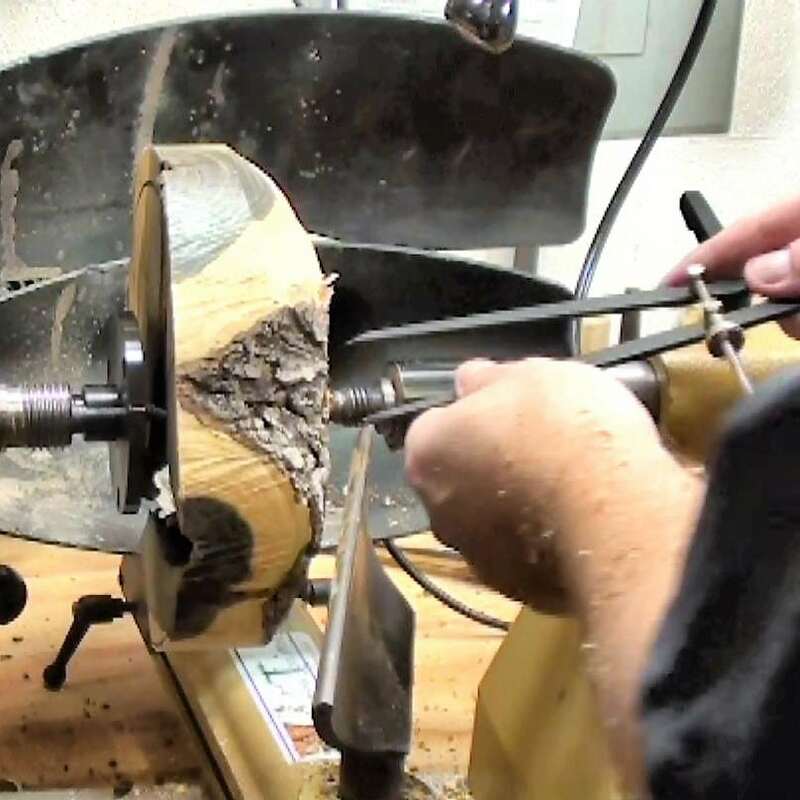 This way the chuck jaws will close around the tenon with maximum grip since jaws are set near to a fully enclosed form of a perfect circle. When marking the tenon with dividers be sure to touch only the left leg and not the right, otherwise the dividers will kick out and this could be dangerous. To cut the tenon I used a small 3/8” spindle gouge with a very pointy swept back grind. With a very shallow flute, the wings on this spindle gouge are almost flat. The nose angle is between 40 – 45 degrees. 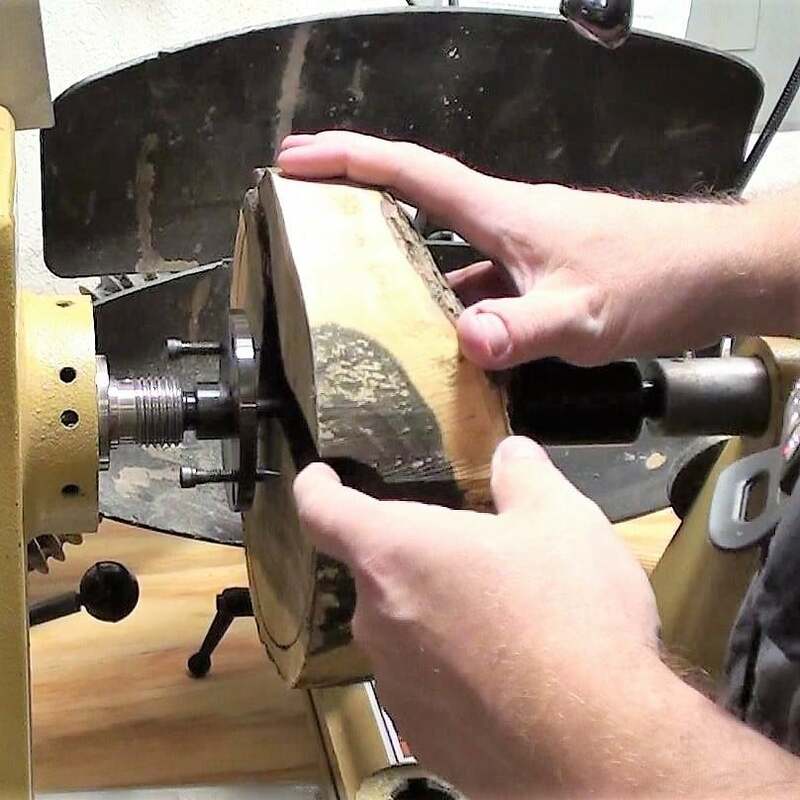 This is the tool I almost always use to cut a dovetail tenon. It is easy, fast and accurate. 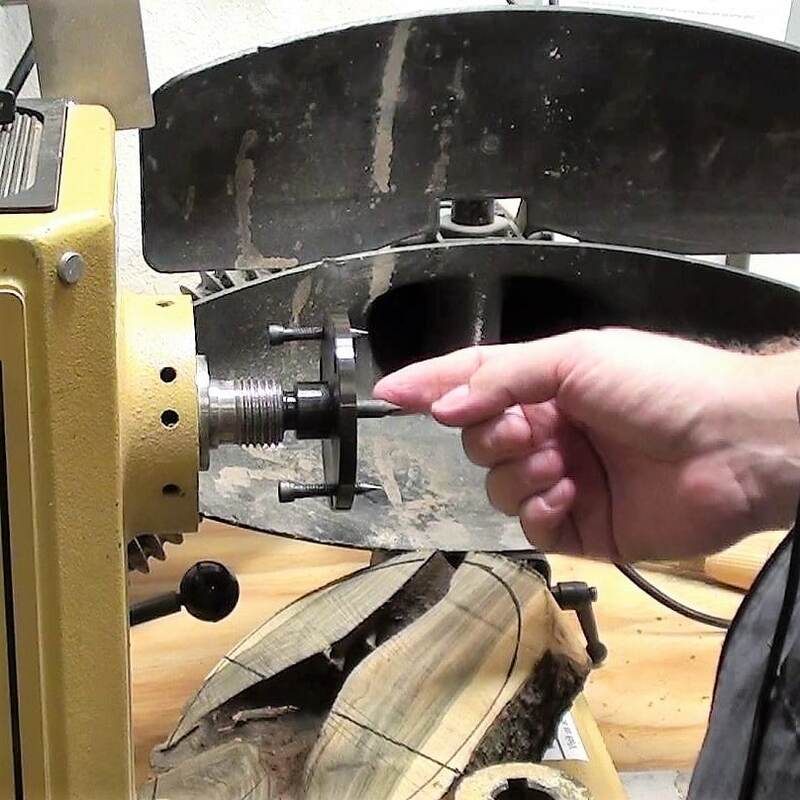 Be sure to reduce the size of the nub held by the tailstock. It needs to be small enough to fit inside the small diameter of the chuck jaws without interfering with the closure of the chuck jaws. 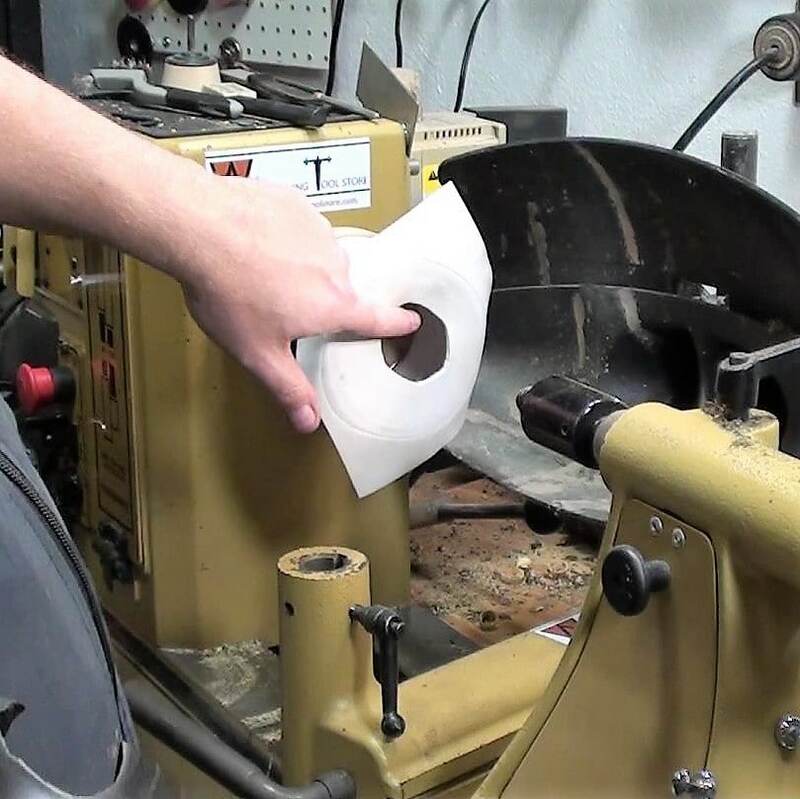 Be sure not to remove this nub as it will be used as a tailstock reference when it is remounted to finish the bottom. 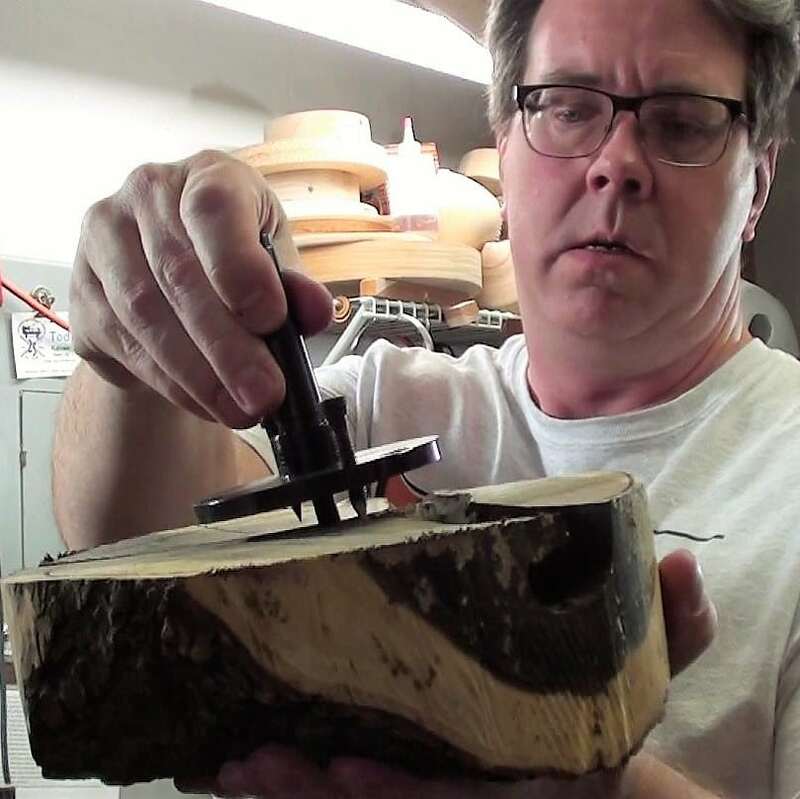 I used the bowl gouge to level out the top of the bowl blank by working between the headstock and the blank. This was really rough going since there were three void areas so I ended up turning up the speed from 650 to about 1700 rpm. The piece was still not balanced fully but as I turned up the speed I made it through the vibration and up into a speed range where the harmonics canceled out the vibration enough where I felt it was safe and fast enough to cut smoothly. As you can see I was in a position out of the ‘firing line’ and behind the tool rest so if catastrophe struck I was in a position to minimize any impact to my body. Of course I was always wearing my face shield. I eventually found that scraping Texas ebony is the best way to produce a final finish ready for sanding. So I used a slightly radius square end scraper to level and smooth the surface. I also used the same scraper tipped up at 45 degrees to shear scrape. I power sanded the piece from 120 grit and progressing up through all grits to 1500. The tight, hard grain took a nice luster with this sanding protocol. All that was needed for a finish was a buffing wax. 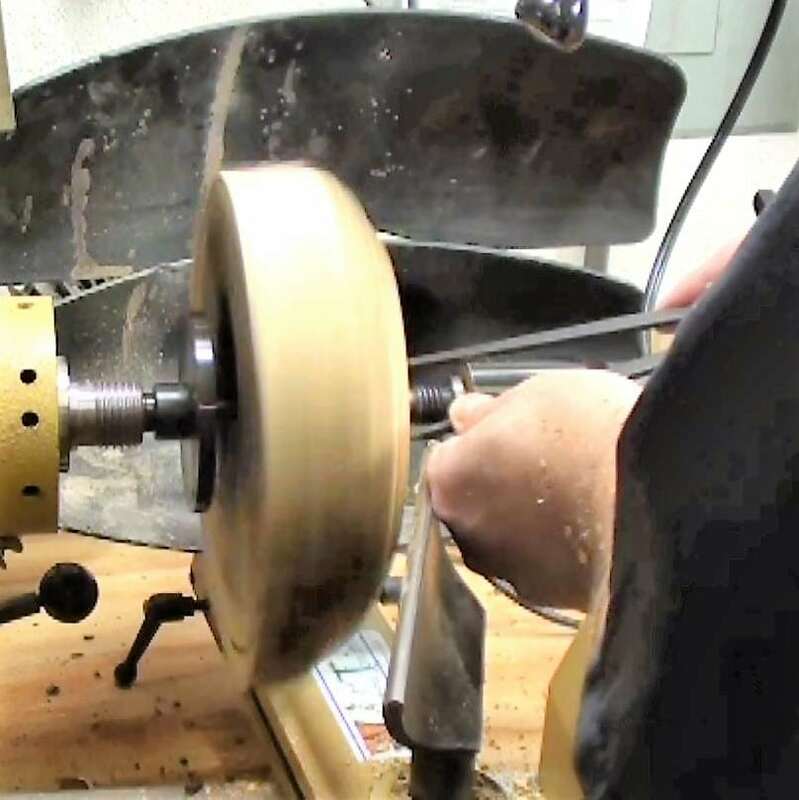 The bowl was remounted in the chuck ready to hollow out the inside of the bowl. 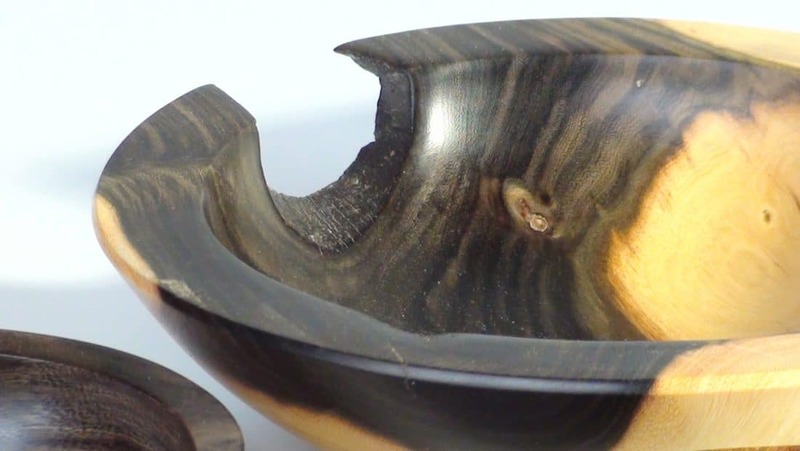 You can see the voids throughout the bowl created by bugs and decay. 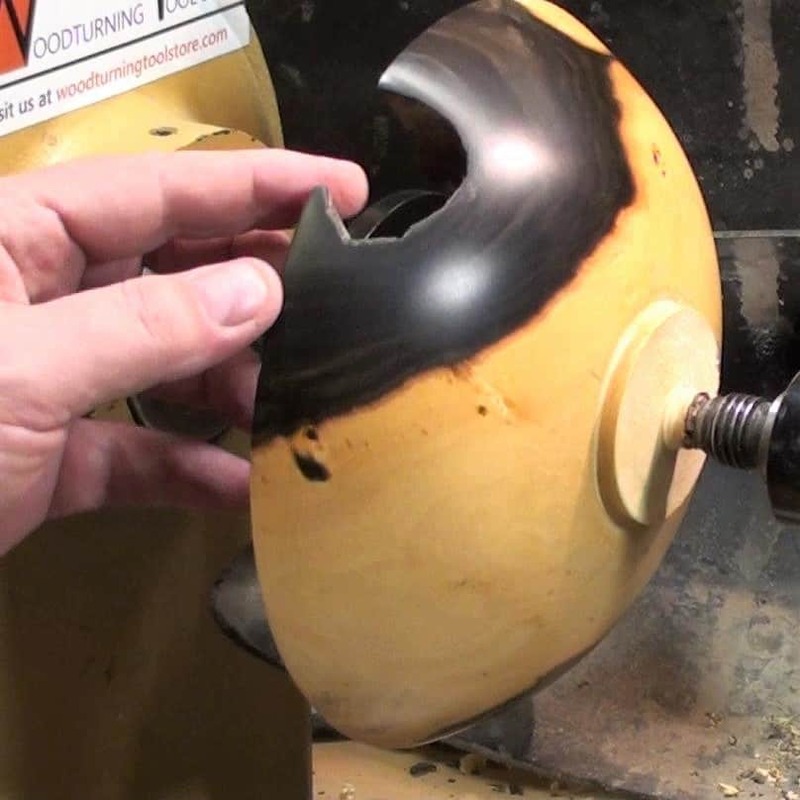 I tried to use my bowl gouge to hollow the bowl out in the traditional way but the voids were making it difficult. So I brought out my scrapers. The first one is a name-brand tool with a half round bar and a bit holder. I attached one of my T1 HSS teardrop cutters and went to town. The scraper cut really well. The T1 HSS is hard, durable and holds its edge really well. 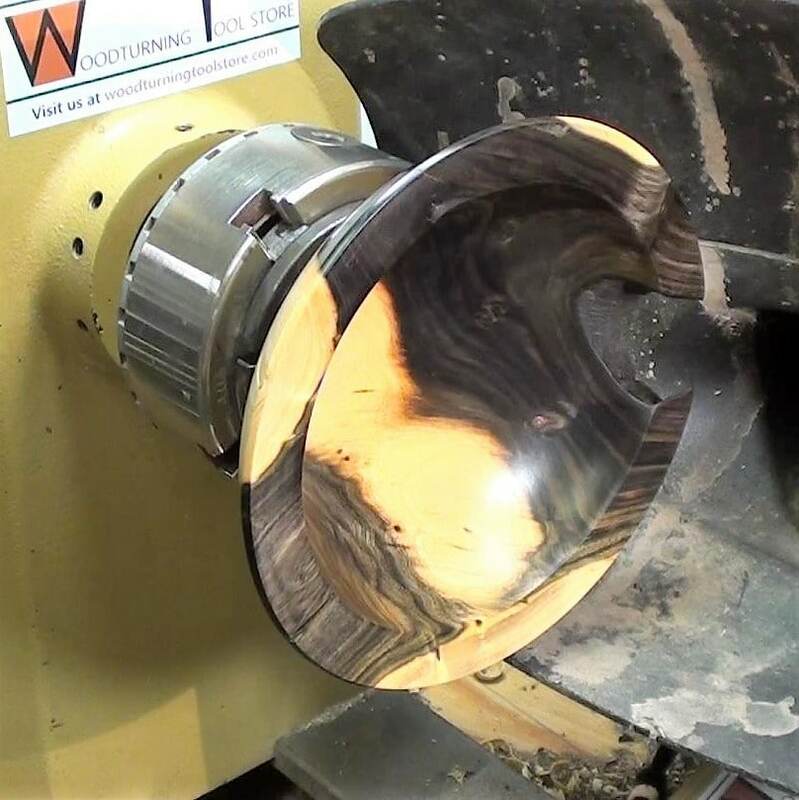 I also used a 3/8” thick radius nose bowl scraper to make some final finish cuts on the inside. 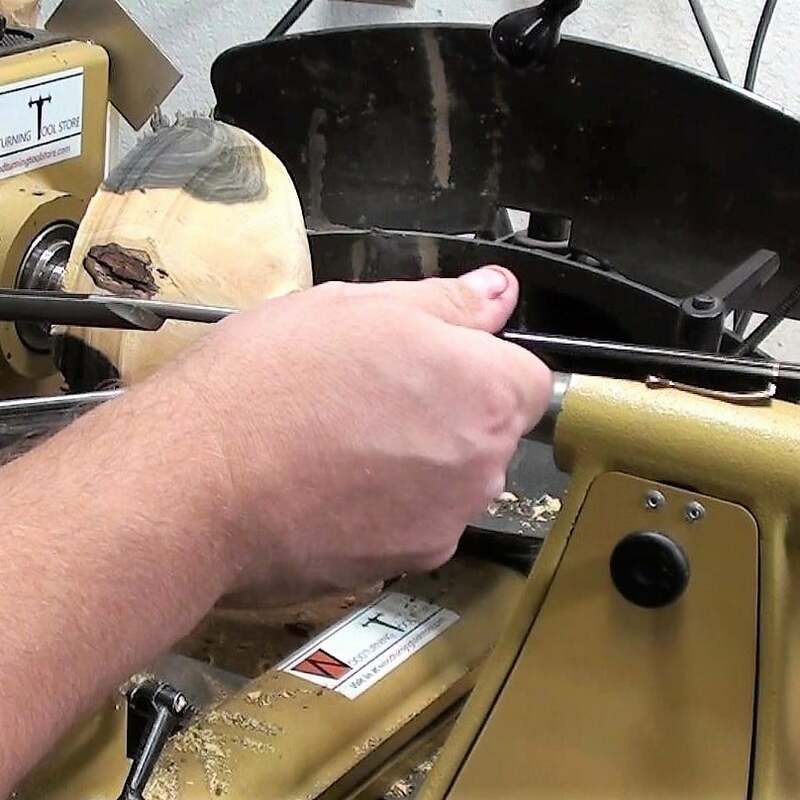 Here is a small bit of video showing how effective the T1 HSS Teardrop cutter is at removing Texas Ebony. 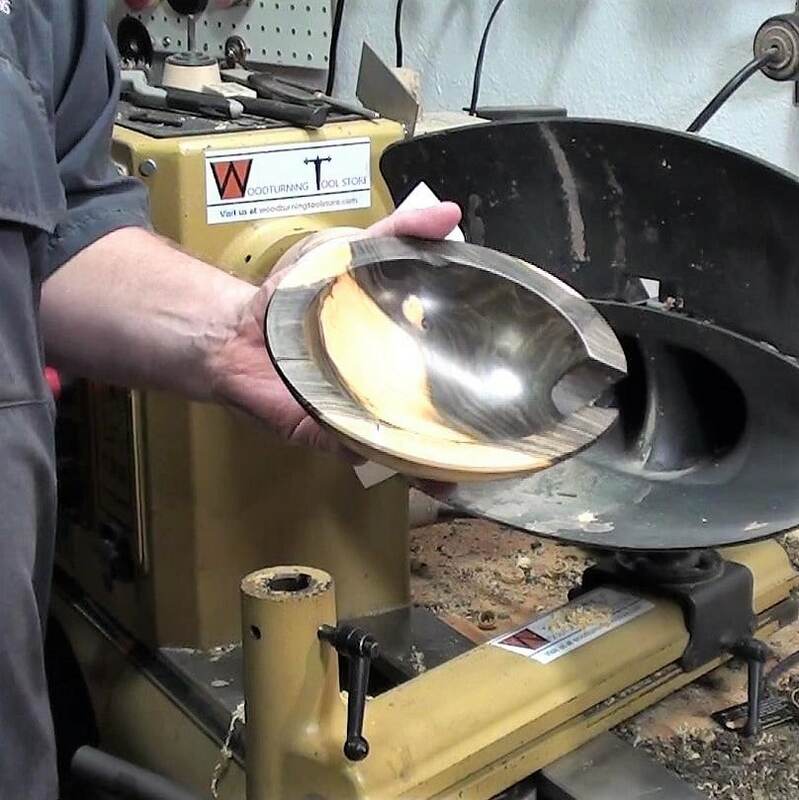 This video was taken when turning the third small bowl that I made but the process is the same used in the original bowl. The same sanding and wax finishing protocol was used on the inside. I had to be careful of the void when sanding but I ended up tearing up a foam backing pad on my sanding mandrel on the void opening as it whizzed by during sanding. Well I am thankful I now have a vacuum chuck. It is a luxury item that not all turners have. 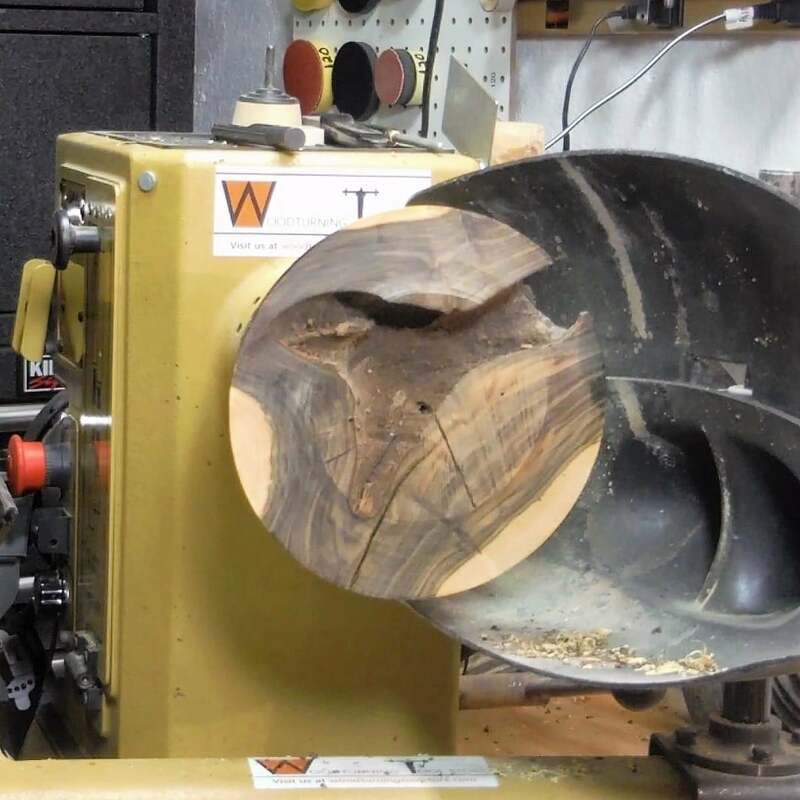 If I didn’t have a vacuum chuck I would have turned a jam chuck out of pine or poplar and friction fit the bowl in this jam chuck. However, with the vacuum chuck I used the nub we left on the bottom to register on the tailstock and mounted the blank on the lathe. 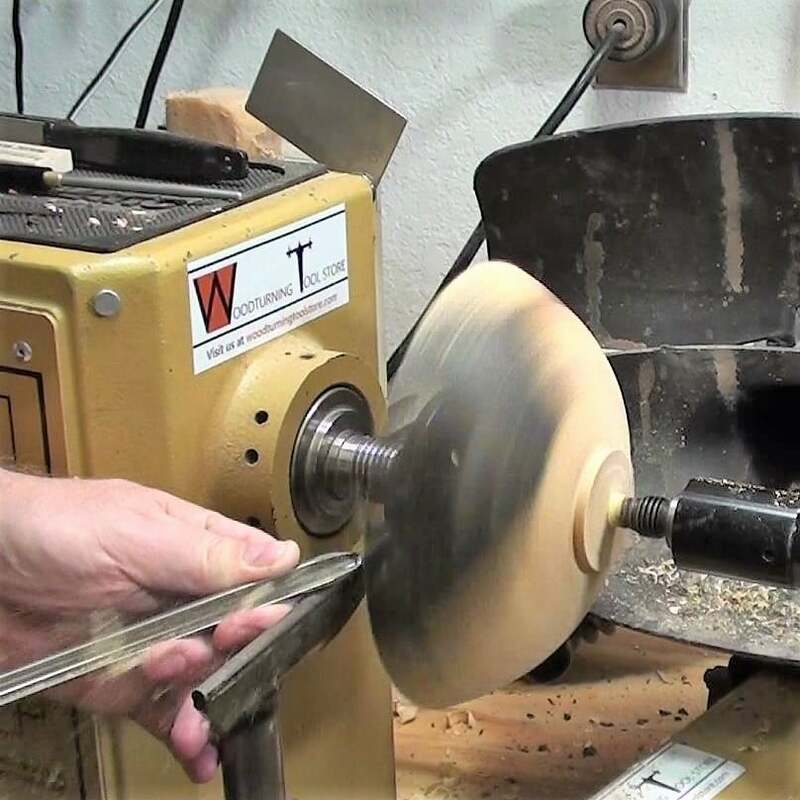 I tested the fit by holding my finger on the tool rest with the tip of my finger judging the wobble as I turned the bowl by hand. Once I was satisfied with where the bowl sat I turned on the vacuum pump. 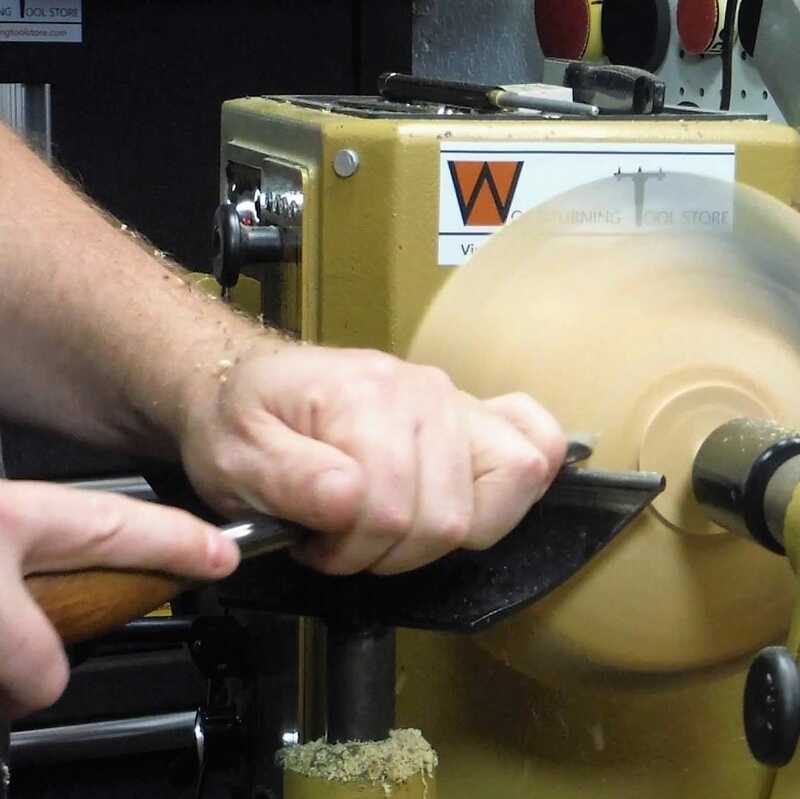 I then retested with my finger in the same manner with the lathe running slowly. 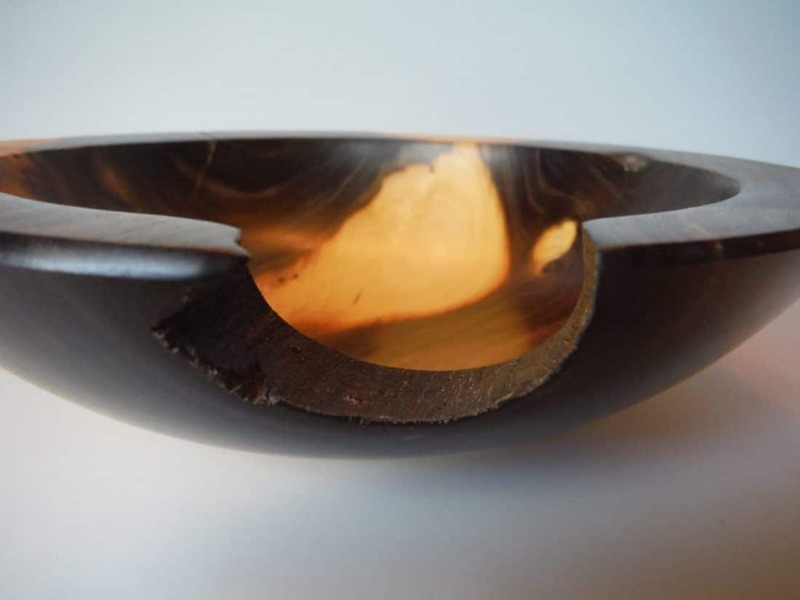 Using a small bowl gouge, I removed the nub and tenon and smooth out the bottom and create a small depression which created a solid foot for the bowl. I finished the bottom with the same sanding schedule as before and then used a three-point tool to create two decorative ring. I did some final sanding and then waxed the bottom. 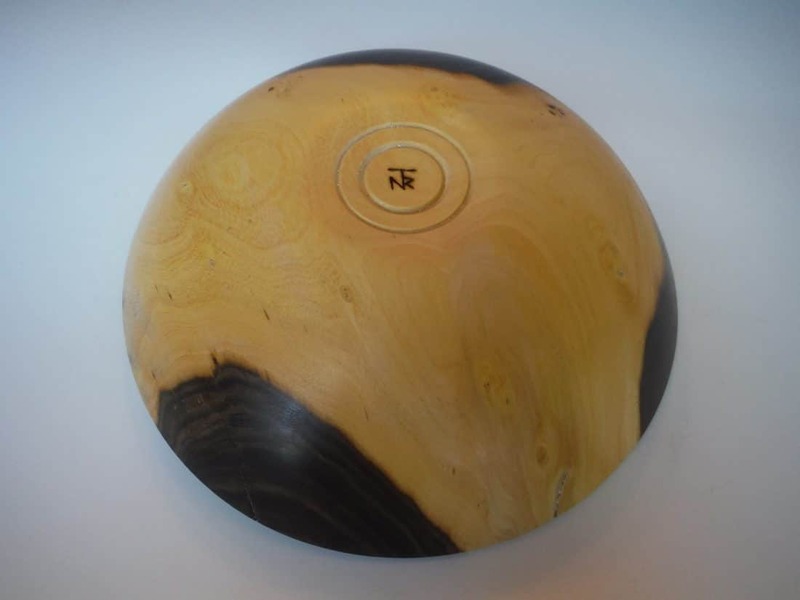 And at last, release the vacuum pump suction and “Bob’s your uncle” there is a beautiful Texas ebony bowl. 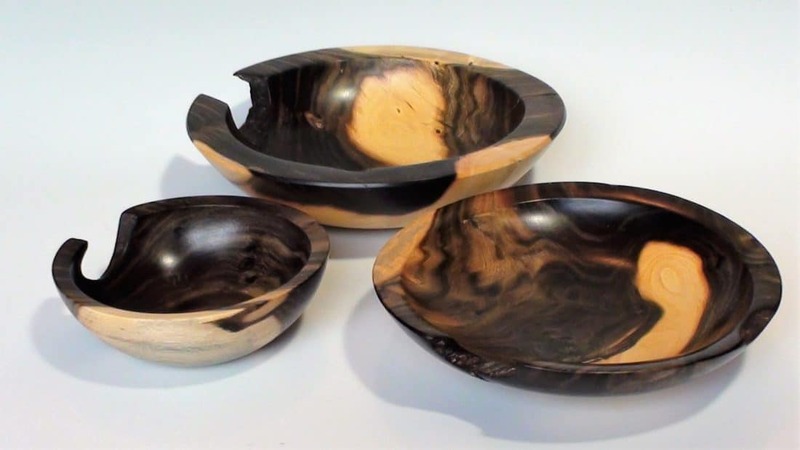 I turned two more bowls from the other pieces of the log. I tried for a forth piece but it was too cracked and infested with ants. Very nice work Tod. Glad you recorded the process. Can’t wait to see what you do with the next piece of wood you get from me.